What tot could resist wiggly, colorful worm fun!? BeginAgain’s new Earthworms are made up of super fun chunky wooden beads that twist, bend and move about due to the safely encased thick elastic band. Babies will be stimulated and enchanted by the colorful worms with their happy faces. Slightly older tots will be equally impressed with the new Earthworm Racers – cute little worms that can be pushed or pulled, plus twisted about on floor-safe wheels. Both sets are made with eco-sound rubberwood plus child-safe paints and are perfect for encouraging your baby or toddler to play and learn how to manipulate objects. What tot could resist wiggly, colorful worm fun!? 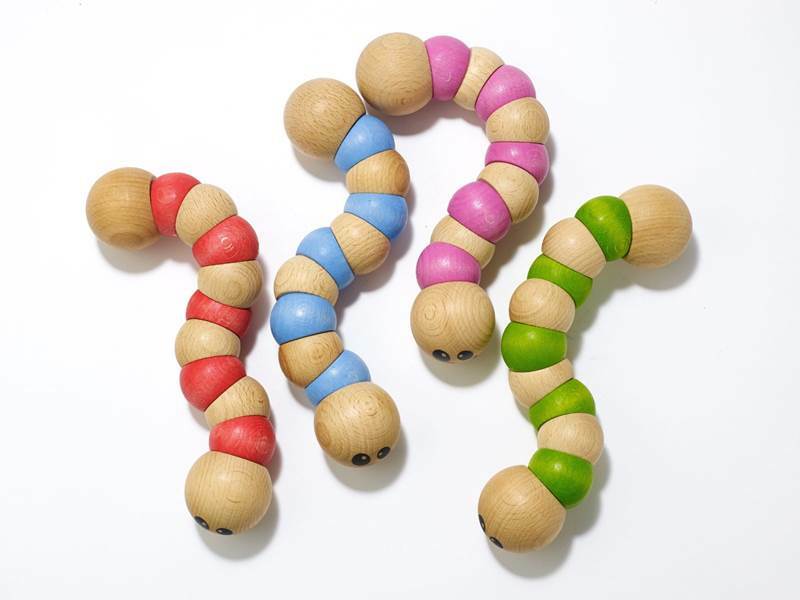 BeginAgain's new Earthworms are made up of super fun chunky wooden beads that twist, bend and move about due to the safely encased thick elastic band. Babies will be stimulated and enchanted by the colorful worms with their happy faces. Slightly older tots will be equally impressed with the new Earthworm Racers - cute little worms that can be pushed or pulled, plus twisted about on floor-safe wheels. Both sets are made with eco-sound rubberwood plus child-safe paints and are perfect for encouraging your baby or toddler to play and learn how to manipulate objects.